In recent times, mobile gaming has emerged as the latest trend and the gaming freaks are now leaving their PC’s and switching to mobile gaming. However, the mobile touch screens are not able to do justice to the gaming experience and to make it more real, tech companies are now launching the range of gaming devices and controllers every day. To take the whole gaming experience a notch higher, the tech experts from Amkette have listed down the best games you could play using your gamepad controllers. Asphalt 8 Airborne is an adrenaline-pumping racing game that lets you drive your dream cars through 13 exotic real-world locations, including Venice, Iceland, and San Diego Beach, featuring cars like Lamorghini, Pagani & Bugatti. And what better way to drive your favorite car in your dream city than getting a hold of it. Modern Combat 5 is an intense first-person shooter game with amazing graphics and realistic sounds. 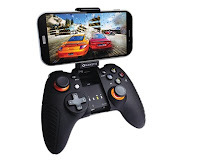 Make your gaming experience even more realistic with Amkette’s Evo Gamepad that gives you the power to play any Android game on your smartphone as an extension to your hands. Dead Trigger 2 is the best zombie shooter game ever. Just take your part in saving the world and win unbelievable real prizes in specially designed tournaments. You can travel across 10 regions in different parts of the world, explore 33 unique environments, grab your favorite Zombie annihilator from 37 kinds of weapons and go for the action in more than 600 gameplay scenarios. Unkilled is a kind of game that will keep you glued to it and won’t let you die as it offers five kind of helpers to save you from any kind of danger. It has more than three hundred missions, which means tons of hours of gameplay. BombSquad is a fun multiplayer game where your mission is to beat your opponents using bombs, fists, and wits in thrilling races, vicious fights, or classic games where what matters is getting out alive. It is the game that demands all your attention and there’s no room for any kind of distractions. Grand Theft Auto is an action-adventure game series that lets you through different parts of the city. This is definitely a hit among the children and youth out there. Instead of fumbling around the touch screen, trying to hit enemies you can barely see, you can now use the deadly accuracy of the gamepad to blast your way through any dire situation. Brothers in arms 3 – is a linear shooter tailoring the events of the World War II. You will need to run from one cover to another and shoot all the enemies you meet on your way. Gamepads are there for a win as they make you feel how it’s like to be a real participant of the events of the World War II. Hit your best shot using your racket in Virtua Tennis Challenge. With Virtua Tennis Challenge, you can now play with top ranked professional tennis players on your Android device. This game allows you to compete against 50 players from around the world. This game features several game modes to play in different environments and compete in different challenges.